I saw this advertised on facebook and decided I had to try it out. It claims to last for "days" and be able to be applied within two minutes. I thought this sounded interesting and while I wasn't looking for a product to last for days, I tend to prefer to be able to remove all makeup at night, I definitely wanted to give it a try. It comes in four shades, I chose Blonde which is actually still pretty dark so I'm not sure how great a shade it would be for lighter blondes. It comes in a plastic tube which has a brush applicator, it does say you can use it straight from this brush, however I decided against this as there is a lot of product on this brush. I tend to apply this on the back of my hand and then use the Anastasia Beverly Hills Number 12 brush to apply it. 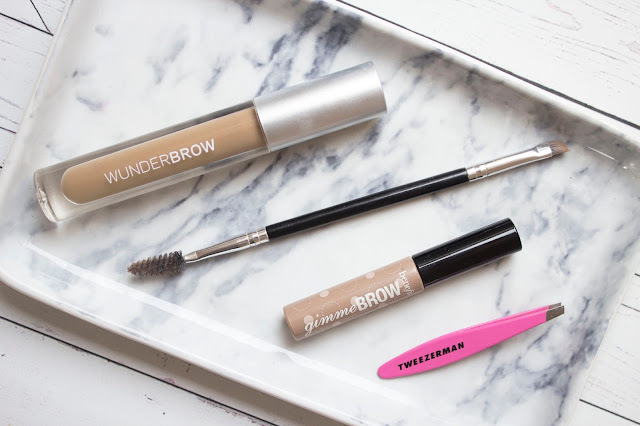 The consistency is very liquidy which I find quite difficult to apply as I prefer more waxy and thicker consistency eye brow products, therefore I find it takes a lot longer than two minutes to apply. Now this product does last REALLY well, it lasts better than Anastasia Dip Brow Pomade. On their facebook page there are videos of girls rubbing their eyebrows and the product doesn't budge, however when I do this (albeit very roughly) it did come off slightly and look slightly messy. I personally wouldn't wear this for more than a day so I can't comment on how well it lasted for a longer period of time. I tend to apply Benefit Gimme Brow over the top just to set them in place. Overall I do really like this product, if I am in need of a product that lasts all day, I will definitely reach for this over the Dip Brow Pomade. But for an everyday product, I will stick with the Dip Brow. You can buy it from Boots here.